Turmeric Rice with Coconut Kale | Naturally. For many years, I avoided turmeric. There was an accident in one of our early rental houses that left a counter completely stained thanks to a turmeric spill. From that day, I was a bit frightened to use it. I didn’t want to do any more damage. Of course, times change and it’s become a staple ingredient for me. It’s in all my curries, grain bakes, and especially this turmeric rice. Turmeric has a unique flavor and can add such a color to dishes (as probably evident in the rice above). If you’ve never tried turmeric as a main ingredient, I recommend starting off with 1/2 teaspoon and increasing as desired. For these particular photos, I added upwards of two teaspoons. A filling vegan dinner with two of my favorite components: easy turmeric brown rice and rich, coconut-creamed kale. Perfect for dinner or even breakfast. Heat a medium sized pot over medium-low heat. Add the onion and cook for 4 to 5 minutes, until the onions are translucent and fragrant. Stir in the ginger, cooking for one minute. Next, add in the rice and turmeric, toasting for one more minute. Measure in 1 1/2 cups vegetable broth and bring mixture to a boil, reduce to a simmer, cover, and let cook for 35 to 40 minutes, until the majority of liquid has been absorbed. Remove from heat and allow to sit for 10 minutes. 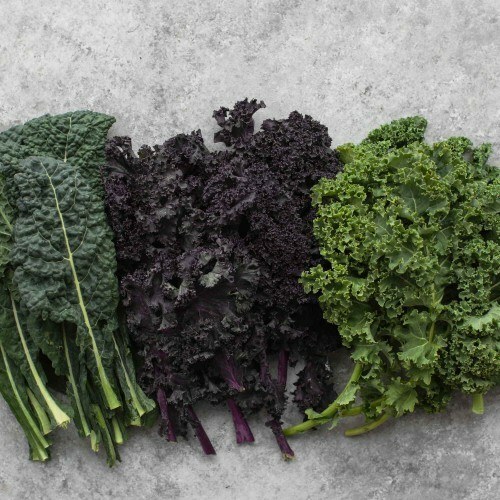 Prepare the kale by removing the stems and cutting the leaves into 1/4 inch strips. Towards the end of the rice being ready, heat 1 tablespoon of olive oil in a large, wide pot. Add in the garlic, cooking for roughly a minute. Add the chopped kale and stir to coat with the garlic. Add in 1/2 cup vegetable broth, cover, and let kale cook for 5 minutes, stirring occasionally. Add in the coconut milk and continue to cook greens until tender, roughly 3 to 5 minutes more. Taste and add salt as needed. 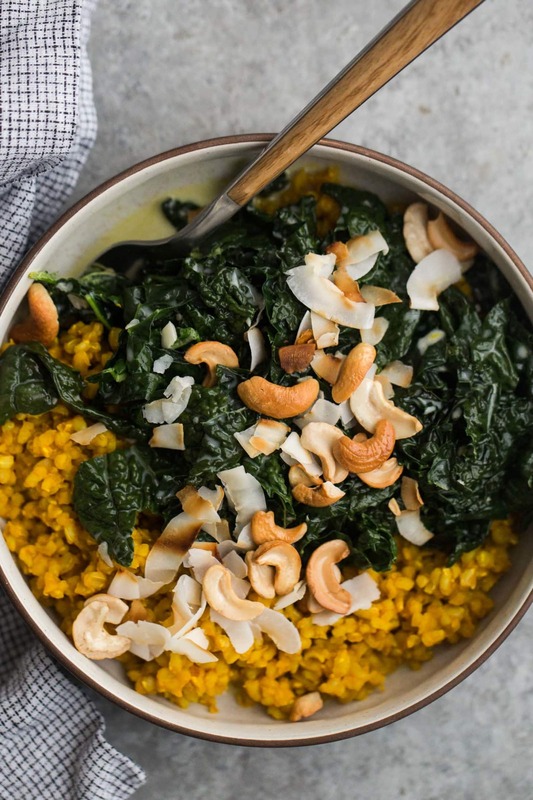 Serve greens over a large scoop of turmeric rice and top with toasted cashews and coconut. Tips & Tricks: As mentioned in the recipe above, let your grains sit, off heat, after cooking. This helps keep them intact so your grains are nice and fluffy and not sticky. I use full-fat coconut milk found in the can. I like to transfer the coconut milk to a sealed container and shake well to blend together. What I love most about this meal is that the variations are endless while the flavor profiles stay the same. You could mix up the greens, change out the grain, and add protein, completely changing the meal. All while keeping the coconut and turmeric flavors. Protein: My favorite thing to do is toss in chickpeas with the kale but other legumes or tofu would work, too. Greens: Chard and collards are the best greens to replace the kale as they stand up to the heat just as well. Grains: I love brown rice but it takes a bit of time to cook. Turmeric works beautifully with millet and cuts the cooking time in half. Of all the greens, I use kale the least. I’m not terribly big into eating it raw but I do love kale chips and dishes like this turmeric rice. I find myself using lacinato kale but really any variety could be used. This looks fabulous! It’s so beautifully styled too! This sounds SO delicious! I don’t do brown rice but I’m going to try to do it with cauli-rice… the photos are making my mouth water! This looks delicious! I love turmeric (stains and all! ), so can’t wait to try this. Thank you, Erin, and hope you had a great Christmas and New Year! This looks and sounds amazing, I am going to give it a try this weekend, thank you for sharing. This looks delicious!! Can’t wait to make it. I had a similar incident when I made roasted cauliflower covered in turmeric–it completely stained my baking sheet! I learned to use foil after that problem. I have accidentally spilled on the counter and have found that the “magic eraser” works wonders! This is stunning, girlfriend. Glad you’re back on the tumeric train. I made this as a healthy weekend breakfast. added some raisins on top for a little burst of sweetness. Great recipe! Thanks! Oh my! I made this tonight for dinner. I am not sure what I expected, but I loved it soooo much, I am so excited I have some leftover. I used two bunches of kale because mine looked small, two cloves of garlic because mine looked huge. I only had white rice, so that was what we had. I had coconut flakes and toasted them in a little skillet so they wouldn’t taste raw. I didn’t have cashews and can only imagine!! This is a winner! Turmeric is probably my all time favourite spice – this looks yum! This looks so delicious! I’m keen to make it. Sorry if this is a silly question but can you give a rough approximation of many grams a bunch of kale should be? I’m not really sure about grams, but I used roughly 12 leaves. Hope that helps! Delicious idea, Erin –– thank you! I think I’ll go make this for lunch now, with tofu as you suggest … and I think I’ll replace the olive oil with coconut oil, no? Seems to make sense! That makes sense- I didn’t have any on hand at the time! Made it and it was insanely delicious. It’s on my roster of dishes forever! This is so delicious! I am going to make for the third time tonight! I’ve eaten the components but not the dish. It’s on my stove top waiting for guests. 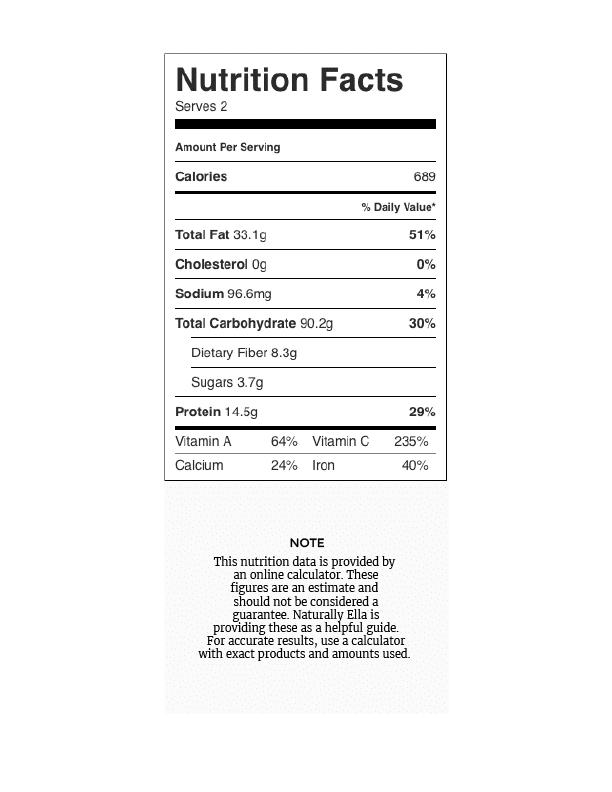 I used cauliflower–it is amazing!! Can’t wait to eat it. This has become a regular recipe in our house. It is SO delicious. The combo of kale and coconut milk? Genius. And I try to cook with turmeric as much as possible – it is so healthy. Thank you for an amazing recipe. I have recently adopted a vegan diet but will admit a slight aversion to cooked greens… a slimy pile of almost effervescent snot? No thank you! This however, looks absolutely delicious! I love turmeric rice especially when made with plenty of coconut milk and ginger but I think I would pair back the coconut in the rice to make up for the coconut kale. Simple! PS: I love that most of your recipes I have looked at are for small servings. Perfect for me as I am one vegan in a family of five carnivores! Keep the recipes coming Ella I love it! Definitely going to do it again! Everything was such a perfect blend. I would suggest keeping with the recipe. The bitterness of the kale, complimenting the sweetness of the coconut and cashews. The sweetness contrasting with the saltiness of the turmeric rice…. SO. DARN. GOOD. One of my favorites now. I’ve made this several times and it’s so delicious! I put some chickpeas in the bowl for added protein. Comforting, hearty, and just plain yummy! Hi there! Do you reckon quinoa would work in place of the brown rice? I think it’s worth a shot- I don’t see why it wouldn’t! I made this last night and it’s amazing, thank you for this recipe! I threw in a can of black beans for protein/because I was thinking of a black bean and kale dish I really like at a local restaurant. I look forward to trying this again, both with black beans again and with different beans or with chickpeas. Also, as a bonus, the amount of coconut milk I had left over was basically the perfect amount for me to use to make coconut milk overnight oats – mmm. This recipe is so ridiculously good! Thank you, thank you! Making this again! It has quickly become one of my favorites. I had extra rice leftover last time so I threw another quick coconut sauce recipe together with broccoli because it’s what I had on hand. Oh my…this one is so versatile! Great recipe. 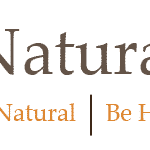 For those striving to maintain an alkaline PH, cashews are highly acidic. Consider using almonds, walnuts, macadamia nuts. I don’t eat rice. Have you tried making this with riced cauliflower? I’m curious about that and wonder if it would be too much coconut milk. Thoughts? I meant too much broth! I’ve not really dabbled in riced cauliflower but I have a feeling that yes, you would want to cut back on the broth. Maybe start small and as needed?